The player provides both internal and external filters with a fully controlled environment in terms of connections to other splitters, decoders, audio/video transform filters and renderers without grappling with the DirectShow merit system. Internal filters are not registered to user’s system to keep it from being messed up with system filters. Enjoy medias without installing codecs separately. KMP supports both built-in and 3rd party codecs. KMP’s built-in codec is faster and reliable because it process internally. The current built-in codec supports all ffdshow codecs and also codecs that ffdshow doesn’t support such as MPEG1, 2. Features audio codecs (AC3, MPEG1, 2, AAC, WMA 7, 8 etc.). Matrix/normalizer options through built-in voice codec. Through KMP’s built-in codecs, you can enjoy all major media formats. KMP additionally supports 3rd party codecs for users that doesn’t use the built-in codec and also doesn’t install the codecs on the computer like other codecs do. Most public codec packs+players forces to install the codec on your computer, while KMP does not. This means that installing KMP will not affect your computer at all. AVI format originally have problems when trying to view corrupted files. KMP therefore supports various methods to play AVI files. First, KMP utilizes the ‘AVI Splitter’. Minor corrupted AVI files can be viewed through previous versions of AVI Splitter. If it still doesn’t play, KMP will utilize the ‘AVI Source Filter’ for playback. The built-in ‘AVI Source Filter’ analyses AVI files and plays by skipping bad frames. If it still doesn’t play through the above methods, it will utilize the RealMedia engine to play the corrupted AVI files. KMP is based on DirectShow so it supports almost all Windows Media formats. KMP also supports Winamp, RealMedia, QuickTime, Flash(SWF) through KMP’s ground-up technology. 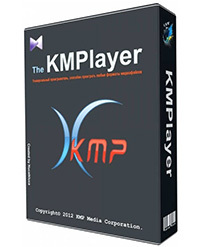 KMP supports the most media formats compared to all worldwide media players. KMP supports DirectShow’s extension WDM (TVs/cameras) and DVDs..
Advanced Video Setup: Remove Afterimage/Remove 3D Noise/Remove Noise in Phases/Add Noise/Fast Forward Mode etc. Manage still images, video captures, filters etc. Flash format supported (FLV, SWF). Watch Live URL broadcasts (VOD, MMS).